A short guide to some of the jobs that need to be done in the garden in May and a selection of plants that are at their best at this time of year. May is a wonderful month to be pottering around in the garden. In comparison to the height of summer, I prefer late spring, the weather is usually not too hot and in most years there is usually sufficient rainfall; these two factors creating almost perfect growing conditions. The workload at this time of year for gardeners is nearing it's peak. This is one of the most time consuming jobs this month but you can rewarded with a longer, more colourful flowering display. Removing the spent flowers from most plants can often extend the amount of time the plant flowers for. Perennial plants that you know will grow to be quite tall in a few weeks time should be staked now to provided extra support and to stop them being blown over on a windy day. You could use bamboo canes and some garden twine or purpose built props are available. Trim evergreen hedges e.g. Box, Yew. Continue to spray roses that are prone to attack from blackspot and greenfly. Plant out Dahlia tubers after overwintering. During May I love to see the bright colours of the Oriental poppies. 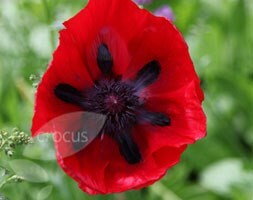 Papaver orientale (Goliath Group) 'Beauty of Livermere' has large bright red flowers with black markings. Loamy, moist but well drained soil and a sunny site are ideal for oriental poppies. If you cut them back straight after flowering they will often produce a second crop of flowers. Ideal for the wildlife garden, these two plants work very well together. Veronica 'Shirley Blue' has a low growing habit. From May until July it produces vivid blue flowers. Anthemis tinctoria 'Sauce Hollandaise' is a taller plant and during the same period it has creamy-yellow daisy-like flowers. Both plants are suitable for a site in full sun on well drained, moderately fertile soil. Plant these together and the local bees and butterflies will be very grateful. Published on 09 May 2011 and Filed under General.